Faith is on a salad kick right now, so she had me stop into the grocery and pick up one of the big salads at the deli. I know, in theory, that all the ingredients are cheaper, but we've been a bit under the weather and it was so convenient! Plus, the big salads at the store give her at least three servings, so it's fairly cost effective. Since the salads aren't high protein, we pack extra protein snacks to go along with her lunch. Both salads are fairly similar--garden salads with lettuce, carrots, cucumbers, no tomotoes! We added shredded cheese to both and in one, she also chose to add diced pepperoni chunks. We meant to add a boiled egg, but I forgot to boil the eggs and you can't put raw egg in a salad. To the side, each one had some pretzels, along with a treat (mini chocolate cookies in one, an oatmeal cookie bar in the other). 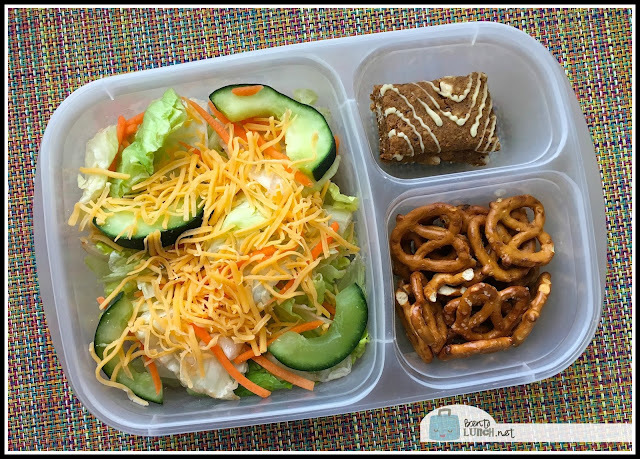 To up the overall protein content, she took a tube of Greek yogurt and a cheese stick among her snacks for the day. I think we will add egg and ham or turkey to her salad next time to make it a little heavier and less reliant on the snacks she takes to round out her meal. 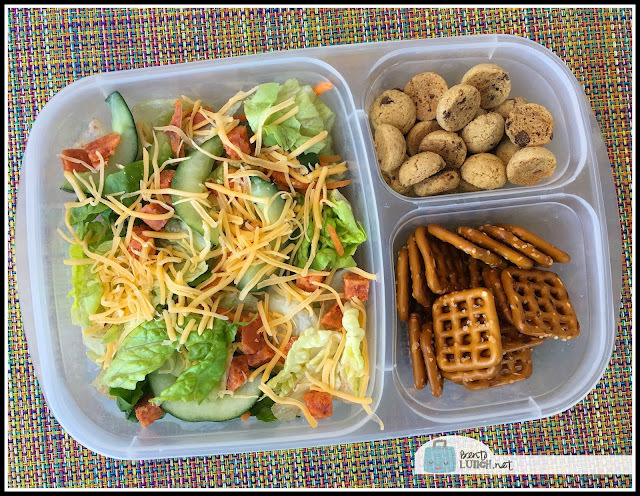 Lunch is packed in our EasyLunchboxes and we used air tight Tupperware containers for her salad dressing.